Thorn strippers if you happen to have them. I am a little obsessed with Fred Johnson Bauer Rose Bowls. I just keep buying them. I am lazy. I do not hunt things down much in the wild as we are not rife with cool thrift shops that have under priced deals in my neck of the woods. Generally, I just click on eBay. Here. You can get them for $35 if you are careful but $50 is a reasonable price. I am kind of digging the plain white ones lately. Okay, now that you have your supplies, pay close attention. 1. Cut the stems to about six to eight inches. You won't want to because you can't believe they should be so short. 2. But go ahead, just do it. Guaranteed you will go too long the first time or two. 3. Put the water in the bowl with the little preservative pack contents. Pretty close to the top. 4. Arrange casually, not too precisely. Best to have a little bit uneven here and there. See, these rose stems are too long. I will have to cut them again. 5. Cutting one more time to get shorter. Best to do this all outside. I am in the laundry room and making a big mess. Not that unusual. Making a big mess OR being in the laundry room. Note: to the far right are the thorn and leaf strippers. I generally remove most of the leaves. I usually mix up my bunches of weird color roses. 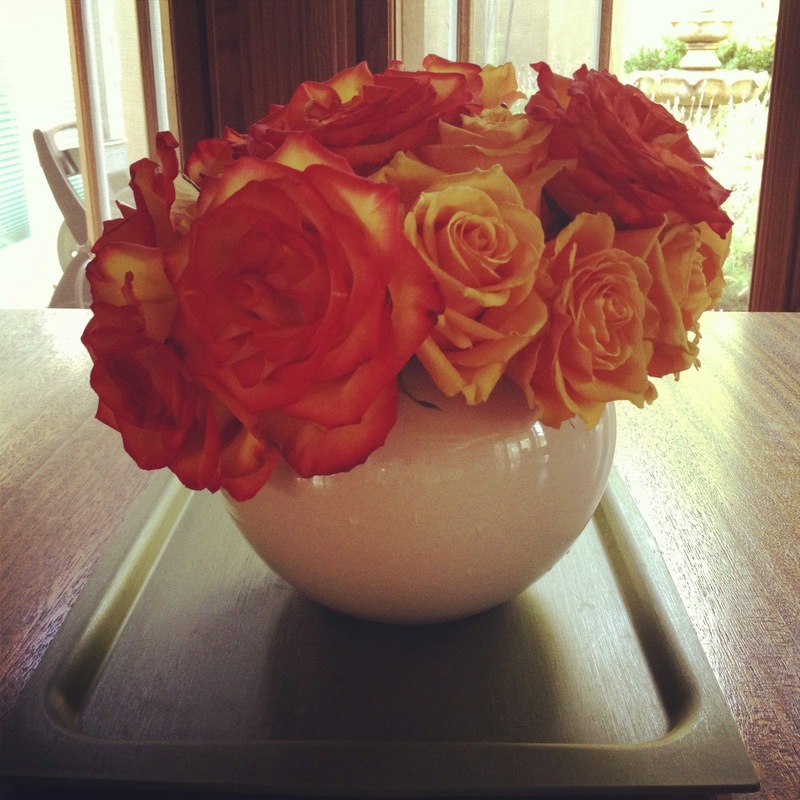 Finally, if you are sitting your Fred Johnson Rose Bowl on any particular surface you care about, use a tray. They are porous on the ring on the bottom. Boo. I learned that the hard way. And last but not least, after a day or two but no longer, fill the water back up to the top. The grocery store roses take a big drink the first couple of days, but not much thereafter. 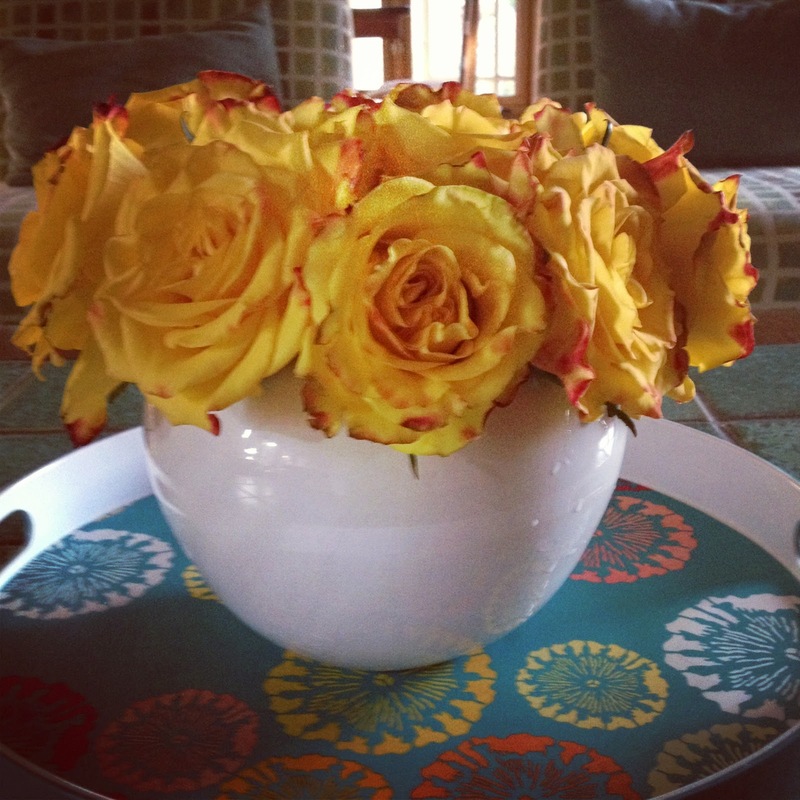 Grocery store roses can last over week. I think this would make a wonderful birthday gift for a special someone... a white Fred Johnson Bauer Rose Bowl filled with roses. Maybe I'll stockpile a couple. I love roses very much. I get some old bowls from my grandma and often style it with very short cut flowers. It looks a little bit "Biedermeier". You make me smile if you write in some blogs they do tutorials... The tray is very lovely too, maybe another tutorial? The flowered tray is last year's Target and the other tray is green vintage from eBay... when I was on the hunt for trays. You can't have too many trays. Yes, maybe another post. Good idea! Very pretty. I'll have to try it, with not a Bauer rose bowl, but some other squatty bowl--I usually get mine at the Salvation Army store. Then I don't cry when I give them away. No crying over pottery gifts. Ever. Great tutorial and great results! Your arrangements are so beautiful.